Forty-nine years ago, air pollution and toxic waste dumping was completely legal, there was no Environmental Protection Agency, and very few laws to protect the environment existed. On April 22, 1970, Senator Gaylord Nelson created an annual call to action by founding the first Earth Day to bring attention to sustainability and environmental issues. Additionally, students, families, teachers, and staff have been encouraged to participate in the Earth Day Every Day Challenge. The challenge is a year-long sustainability competition that begins at the start of each school year and runs through Earth Day. Schools compete with each other by completing activities or attending events that relate to any of the five SFUSD Sustainability Goals . Individuals in a school community (parents, students, teachers, staff, etc.) report photos of the activities they’ve completed or the events they’ve attended to the Sustainability Office for points. The points are tracked all year until April when the winning schools receive a $1,000 cash prize and recognition as an environmental leader in the district. 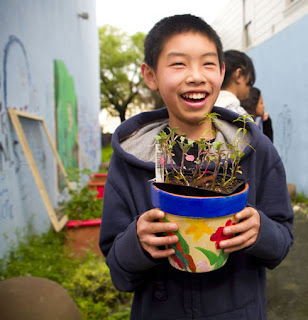 Check out San Francisco Environment’s list of family-friendly activities happening throughout the month of April to celebrate Earth Day while earning points for your school. Wondering whether your school is participating in the Earth Day Every Day Challenge? See the competition leader board here and sign your school up today!